McLaren has sold 3,340 cars in 2017, with two thirds of sales from the Sports Series family. Although the team at Lenspeed has at times wondered whether McLaren could survive in the long term being virtually an independent manufacturer, this news can only embolden the brand further. What’s also interesting is how it’s been expanding its Asian presence aggressively. In Singapore the regional office is now already doing sizeable work across the region. Lenspeed isn’t tugged at the heartstrings yet with McLarens, but maybe a drive would change our mind someday. Around two-thirds of sales are attributed to the Sports Series family, the vast majority of which are new buyers to the brand, with the rest coming from the Super Series. The Sports Series family accounted for 2,119 deliveries, up from 2,031 in 2016. Following the unveiling of the 720S in March, Super Series sales continued to perform strongly with 1,221 cars sold – nearly the same as 2016’s figure despite only six months of delivery. This latest news follows the 2017 introduction of new models in each of the established three product families; the 570S Spider was added to the Sports Series, the 720S replaced the 650S in the Super Series while the track-concentrated McLaren Senna joined the Ultimate Series. Mike Flewitt, Chief Executive Officer of McLaren Automotive, said: “Demand has been strong for McLaren Automotive across our product families in 2017, with interest particularly robust in our biggest market, North America. The majority of sales came from the Sports Series family, our brand entry point that is achieving significant interest and attracting new customers. With a strong order bank stretching well into this summer, it is expected that close to half of 2018 sales will derive from the Super Series. Meanwhile, the Ultimate Series continues to surpass our expectations with a completely full order book for both the newly unveiled McLaren Senna and another future model codenamed BP23. “We are continuing to invest heavily in research and development – £1billion over six years – as part of our ambitious Track22 business plan that sets out and supports our growth. Long-term, the plan will see us launching 15 new cars and/or derivatives up to 2022, with three revealed to date. North America continued to be McLaren Automotive’s single largest market with deliveries of 1,234 cars, up from 1,139 cars in 2016. McLaren continued to expand its global retailer network with additional and updated facilities opening including in Bahrain, Montréal and Denver, along with the confirmation of a new Barcelona showroom. In addition, and in recognition of the brand’s commitment to North America, the US saw the opening of a new 7,500-square foot North American Regional Distribution Centre, which became the first McLaren parts distribution centre outside the company’s UK headquarters. McLaren Automotive announced that it will in-source future production of carbon fibre Monocell and Monocage chassis, leading to the creation of around 200 new jobs at the company’s first bespoke facility outside of the McLaren Technology Centre campus. The new facility started construction in 2017 and is expected to be officially opened in late 2018 to start building carbon fibre development tubs, with full operation planned for 2019. Formed through a partnership between McLaren Automotive, the University of Sheffield’s Advanced Manufacturing Research Centre and Sheffield City Council, the new McLaren Composites Technology Centre is the result of a combined investment of nearly £50 million. The target is that the new Centre will deliver £100 million of GVA (gross value added) benefit to the local economy by 2028. The new McLaren 720S made its global debut at the 87th Geneva International Motor Show as the second generation of McLaren’s Super Series. Its carbon fibre chassis is based around the Monocage II carbon fibre central structure that is key to the 1,283kg lightest dry weight and unparalleled interior space and visibility. It features a luxurious, driver-focused cabin, the finest leathers and aluminium switches. The 720S delivers outstanding driver engagement, with best-ever Super Series aerodynamic efficiency and a new generation of McLaren’s active chassis system, Proactive Chassis Control II, to ensure the widest breadth of dynamic capability of any McLaren, ranging from precise, controlled comfort to the most extreme handling prowess. With a new, twin-turbocharged 4.0-litre V8 engine producing 720PS and 770Nm, the 720S has a power-to-weight ratio of up to 561PS per tonne. The two-seat, rear-wheel drive 570S Spider is the third bodystyle in McLaren’s Sports Series portfolio, lining up alongside the 570S Coupé and the 570 GT. Compared to the Coupé, the 570S Spider added a neatly integrated, retractable hardtop that when lowered delivers an even more immersive and exhilarating driving experience. The 570S Spider combines all the high-performance dynamic attributes and refinement of the 570S Coupé with the added exhilaration of open-air driving. HRH The Duke of Cambridge was given a tour of the McLaren Production Centre led by Mike Flewitt. The Duke met some of the company’s 2,100 workforce who design and hand-assemble McLaren cars, the majority of which are exported around the world. The Duke was also accompanied on his tour by Commercial and Legal Executive Director Ruth Nic Aoidh and Chief Operating Officer Dr Jens Ludmann and he heard about McLaren’s efforts to encourage more young people to pursue science, technology, engineering and maths-based (STEM) careers. In October, McLaren Automotive was announced as Britain’s leading mid-market growth company in a national survey. The company was unveiled as the number one company overall in The Sunday Times Top Track 250 league table, which ranks some of Britain’s biggest companies by sales, growth and profitability. The company announced the expansion of its race-winning activities in GT racing with a number of new initiatives. Headlining these was the announcement that a new 720S GT3 race car will join the successful 570S GT4, and this new model will begin testing this year for launch with customer teams in the 2019 season. To serve customers engaging with the sport in the best possible way, McLaren Automotive has appointed a network of specialist motorsport retailers who will sell road and track products alongside each other. Also from next year, owners will be able to compete in a one-make GT series. Finally, the company will be helping to nurture young motorsport talent with the launch of a Driver Development Programme. The McLaren Senna, the most extreme McLaren road car yet, has been designed, engineered and developed with single-minded purpose: to be the ultimate McLaren track-concentrated car for the road. Bearing the name of legendary Formula 1 driver, Ayrton Senna who won all three of his World Championships at the wheel of a McLaren. At 1,198kg (2,641lbs), the McLaren Senna is the lightest McLaren road car since the iconic McLaren F1. 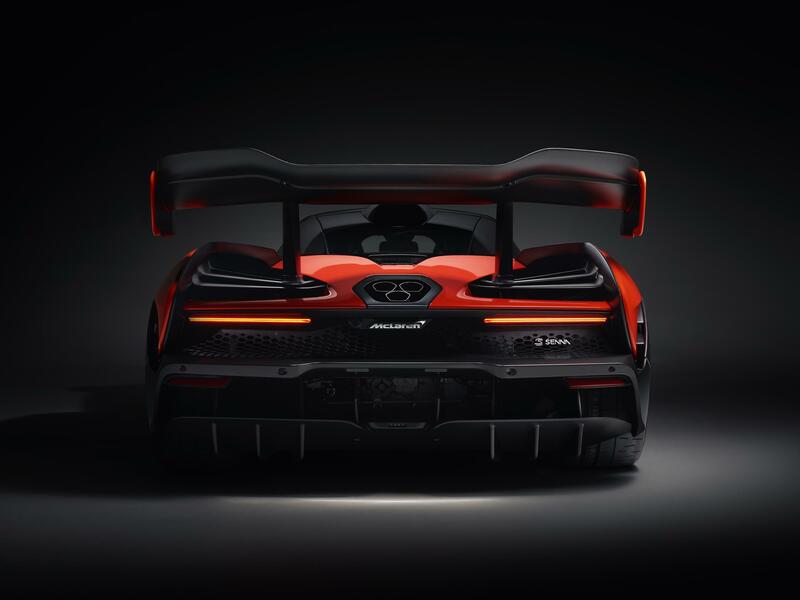 Powered by a 4.0-litre twin-turbocharged V8, which is the most powerful McLaren road car internal combustion engine ever with 800PS (789bhp) and 800Nm (590 lb ft), the McLaren Senna has a power-to-weight ratio of 668PS-per-tonne. The mid-engine, rear-wheel-drive car is limited to 500 units, all hand-assembled at the McLaren Production Centre in Woking, Surrey, England from Q3 2018.